Mick Jagger and Keith Richards return to the Ed Sullivan Theater stage in New York when they present the “Top Ten List” on the Late Show with David Letterman on Tuesday, Deecember 11. 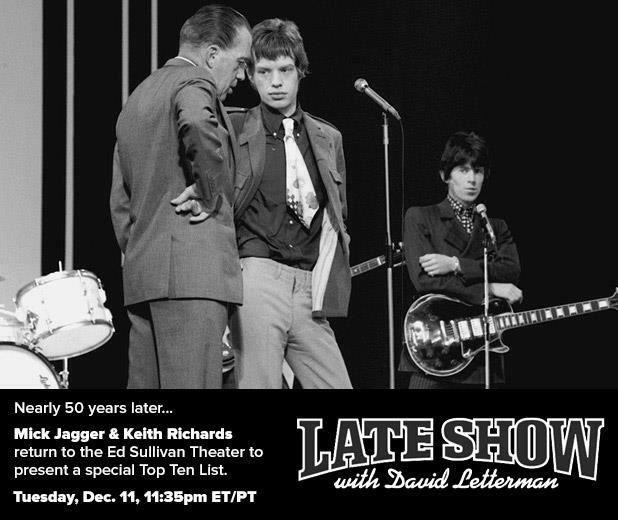 Jagger and Richards, who first graced the Ed Sullivan Theater stage when the Rolling Stones made their first of many performances on “The Ed Sullivan Show” on Oct. 25, 1964, will be making their first visit to the Late Show. The Letterman appearance comes the day before the Stones play the 12-12-12 Hurricane Sandy Benefit concert at Madison Square Garden. The live concert event will feature an all-star musical line-up including Bon Jovi, Eric Clapton, Dave Grohl, Billy Joel, Alicia Keys, Bruce Springsteen & the E Street Band, Eddie Vedder, Roger Waters, Kanye West, The Who and Paul McCartney. The Stones are currently celebrating their 50th anniversary with recently completed sold-out “50 & Counting” shows at London’s O2 Arena in late November. They will perform at the Barclays Center in New York on Saturday before playing dates at the Prudential Center in Newark, N.J. on Thursday, Dec. 13 and Saturday, Dec. 15.